Are you in the market for an exciting RV model that will help you conquer the open road? Then come to Delmarva RV Center! 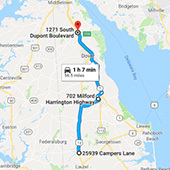 We are proud to be your premier recreational vehicle dealer in Maryland, Delaware, Pennsylvania, and the surrounding areas. Our dealerships in Milford, DE, Seaford, DE, and Smyrna, DE all contain extensive inventories of new and used RV models. You can depend on our experienced staff to listen to what you need for your travels, show you the RV models we have in stock, let you test drive the recreational vehicles that pique your interest the most, and help you find the price that is the most compatible with your personal budget. In addition to our RV models, we have Dutchman towable trailers that you can load up with plenty of supplies for a weekend camping trip in the great outdoors. The goal at Delmarva RV Center is simple: to get you behind the wheel of the RV model you have always wanted, like the popular Heartland Big Country RV. That is why we will be right next to you through the whole process and give you the unparalleled care that you deserve. Delmarva RV Center is also your number-one destination for the maintenance of your RV model. We have a year-round multiple-manufacturer service facility with a 12,000 sq.ft. bay service center to keep your RV model in its best condition. You can rely on our highly-trained service technicians to fix any problems that you have, carefully inspect your RV model, and get you back on the road with a big smile on your face in no time at all. Your home to find an RV for sale has recreational vehicles for everyone, from those who want to embark on a cross-country exploration of the U.S. to those who just want to experience the beauty of nature in absolute comfort. It is time you took your journeys to the next level. Visit any of our three dealerships and let the dedicated team at Delmarva RV Center help you discover the RV model of your dreams today!